Find the most common port numbers below. Some ports may not work, as many hosts block them. Need help? Contact your host or read their documentation to make sure which ports they use. Ports: 25, 2525, 587, 465 (TLS or SSL). The new version of MailPoet no longer supports Elastic Email's API. You will need to setup Elastic Email as an SMTP connection instead (Third-Party). MailPoet now supports sending emails through these services' API connections, so you don't need to set up an SMTP connection to use them. Good news for Amazon users! 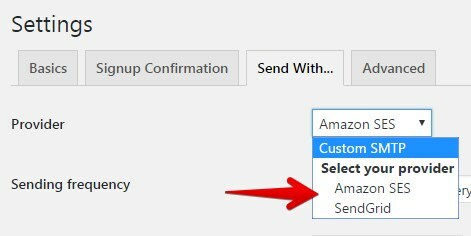 Be sure to select them on the Provider dropdown on the MailPoet > Settings page. You can connect via unencrypted or TLS on ports 25, 2525, and 587. You can connect via SSL on port 465. MailPoet does not support Mandrill's API.